Due to the extremely hot weather forecasted for the GTA, the City of Mississauga has issued a Heat Alert. Check out our home page for more information. The Lions Club of Credit Valley Outdoor Pool (formerly Port Credit) will be open to the public for a Fun Swim from 4pm - 7pm this evening, weather permitting. For more info or to confirm pool times, please contact 905-615-4840. The Warren Marshall Arena & Ron Searle Arena at Carmen Corbasson Community Centre (CC) will re-open on January 3, 2014 following mechanical equipment repair. Programs, leagues and rentals as well as fun skates will resume as scheduled. For more information on this facility, please visit the Carmen Corbasson CC webpage . Thank you for your understanding. The City of Mississauga is pleased to offer over 100 different Summer Camps, 40 unique March Break Camps and Winter Camps too! 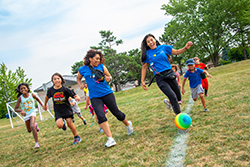 We offer a wide variety of camps at 40 different locations throughout Mississauga’s Community Centres, Museums, Heritage buildings, Arenas, Pools and specialty Sporting facilities. Plan ahead and register for weeks of camp with us when school's out over the Winter holidays, March break and Summer. It's a wonderful opportunity for kids to stay local, meet new friends, try new things and have fun all day, doing activities they love! Find out more about our camps in the tabs above. Please complete and send the Participant Information Request form and submit. The form will automatically go to inclusion.recreation@mississauga.ca or can be completed saved and then sent by e-mail to inclusion.recreation@mississauga.ca. If your child has a life threatening allergy, please print the Anaphylaxis Emergency Plan Package and bring the completed forms for the first day of camp. If you child will be taking medication during camp (inhalers, antibiotics, over the counter medications) please complete the Medication Consent Form and bring for the first day of camp. 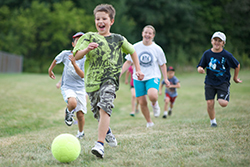 Day camp can be a child's first independent experience away from mom and dad. That's why we offer a safe environment for children to actively learn, grow and develop. Your child has the opportunity to benefit in many ways. We train all our leaders working with children in HIGH FIVE ® Principles of Healthy Child Development (PHCD) to best address the needs of your child. 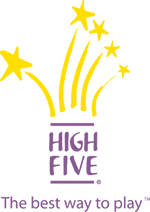 HIGH FIVE ® helps us ensure your child is in good hands and will enjoy a positive experience in our programs. HIGH FIVE ® is the only nationally recognized quality assurance program for ages 6-12. We are always open to your feedback about our programs. Join our team of Camp Leaders and make a difference. We believe that kids' amazing camp experiences begin with amazing people like you. Make lifelong friendships and have fun while helping kids to prepare for the future. Our Camp Leader jobs are available for March Break, Summer and Winter camps. You can lead in the areas of your expertise which may include sports, swimming, skating, educational or creative learning. Our March Break Camps run from March 11 - 15, 2019 at a variety of locations across Mississauga offering both full day and half day camps for children ages 4-14. We have several camps and themes to choose from in which your child is sure to enjoy a week of fun and adventure! Register now to secure your spot, as spaces fill up fast! Why choose a City of Mississauga March Break Camp? We offer 40 different camps across 15 locations in the City! We train all our leaders in HIGH FIVE® Principles of Healthy Child Development (PHCD) to best address the needs your child and their experience. Half Day Camps run 9:00 AM - 12:00 PM or 1:00 PM - 4:00 PM and provide flexibility for parents and kids during the Spring School Break. Our Full Day Camps run 9 AM - 4 PM and offer a wide variety of themes that are creative, inspire learning and teach fundamentals in sports and fitness. We train all our leaders in HIGH FIVE Principles of Healthy Child Development (PHCD) to best address the needs your child and their experience. Extended hours are available before and after Camps (7:30 AM - 9:00 AM / 4:00 PM - 6:00 PM). Camps are affordably priced where Full Day Camps start at $132 per child - that's only $26.40 per day! Our Summer Camps run from July 2 to August 30, 2019 at 25 locations across Mississauga offering over 100 different types of camps all summer long for children ages 4-14. Register your child early, as our most popular camps fill up fast! Why choose a City of Mississauga Summer Camp? All our camp leaders are trained in the HIGH FIVE® Principles of Healthy Child Development (PHCD) to best address the needs your child and their experience. Half Day Camps run 9:00 AM - 12:00 PM or 1:00 PM - 4:00 PM and provide flexibility for parents and kids during the Summer. Camps are affordably priced where Full Day Camps start at $178.50 per child - that's only $35.70 per day! Financial assistance programs are also available through Active Assist. Camps are available for kids with all interests and abilities. Our Inclusion Facilitator Program is available for children with disabilities. For detailed information about Camps click here All About Camps. Our Winter Camps run over the Holiday Break from December 27 - 31, 2018, and January 2 - 4, 2019 at a variety of locations across Mississauga. 4-14, and are affordably priced at only $34.65 per day! City of Mississauga is proud to be the LARGEST accredited HIGH FIVE® municipality in Canada. HIGH FIVE® is Canada's quality standard for children's recreation, culture and sport programs. These standards support the safety, well-being and healthy development of children ages 6 to 12 years who participate in our programs.